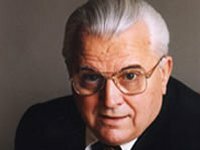 Former Ukrainian President Leonid Kravchuk (1990-1994) has said that the incumbent President of Ukraine Viktor Yanukovych is ready to facilitate the release of people detained during rallies in Kyiv. According to him, this does not mean that investigations against these people will be stopped. The participants in the roundtable, which discussed proposed options for settling the current domestic political crisis, also included parliamentary chairman Volodymyr Rybak and Communist leader Petro Symonenko. An Interfax correspondent reported that other participants in the roundtable were Oleksandr Yefremov, parliamentary leader of the ruling Party of Regions, Maryna Stavniychuk, a presidential adviser and head of the constitutional and legal modernization department of the presidential administration, and lawmaker Volodymyr Lytvyn. The roundtable, held at Ukraina Palace, opened later than scheduled.